I did this layout of Shadow a couple of weeks ago. It has become one of my favorites. 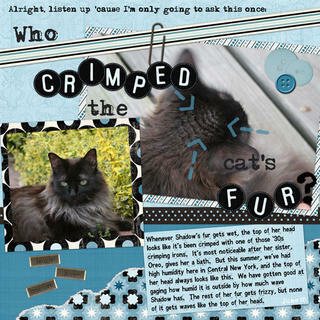 It is a scraplift of Mary Fran’s “Who Dented my dog?”. No one believes us when we say that shadows fur is curly when it gets wet. It’s such an odd thing. Our garage floor is falling apart. There are several large holes. We’ve been afraid for a while that Chris’ car was going to fall right through it one day. So we hired a concrete company to come remove the old one and put in a new one. They arrived Monday. They thought it would be a couple hours work with the jack hammer to break it all up. They started a little after nine. They didn’t finish until almost 7:30 pm. They had to call in 3 extra guys so they could hammer continuously. I had such a headache by noon, and it just got worse all afternoon. And Chris did not understand why there was no dinner on the table when he got home. They spent part of Tuesday and part of today hauling away the large pieces of cement. The smaller stuff they leveled out and will use as a base for the new floor. The cement truck is supposed to be here by 8am tomorrow morning. It will be nice to have this project finished…I miss my garage when it’s raining outside. Last weekend my Dad and I went to the NASCAR races in New Hampshire. Saturday was the Busch series race, and a kid from my home town was making is debuet. His name is Ryan Moore. We’d seen him race a couple of times before in the Busch North League (at Watkins Glen and NHIS), so it’s nice to be able to follow his career. Ryan qualified 19th in the #81 Oreo car owned by Dale Earnhardt Inc. 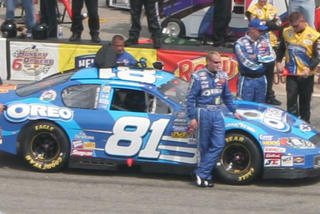 He ran really well, moving up several places in the first couple of laps, which is hard at New Hampshire. He was as high as 6th place before he got spun out and hit the wall. He should definately be proud of his performance though. It was a great race to watch! Got home from Maine on Monday, and spent all day Tuesday lying on the couch reading Harry Potter. I had been waiting so long for this! The book was good, not the best though. It was kinda just a filler book setting up for the final book. I had figured out who was going to die about half way thru, but I was totally surprised by the Half-Blood Prince. Didn’t see that one coming at all, but looking back, I don’t know how I could have missed it. Now I will just have to wait patiently for the final book to come out. Or I guess, wait patiently for November when the 4th movie is released, then wait patiently for the last book. These puzzles seem very interesting…haven’t done many of them yet though. Had you asked me back in may if I wanted to run a 5K race, I would have called you crazy. But I did it! Chris and I ran the Cazenovia 4th of July Foot Race 5K this morning. I was able to run over 4K of it (walking a little bit at about the 3k mark), and I finished in 36:51. I was #367 out of 374, so I wasn’t even last! I’m proud of myself for doing it! Posted in Life | Comments Off on I did it!